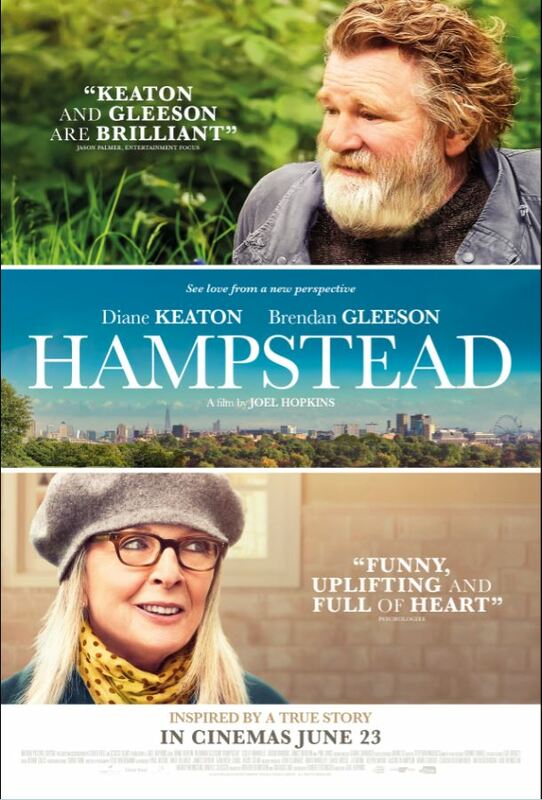 Hampstead, starring Diane Keaton and Brendan Gleeson, is a pleasant movie. It's an enjoyable tale that never gets too challenging emotionally, never gets too deep into any of its characters, and manages to have just enough quirky humor to provide a few decent smiles, making it a worthwhile way to spend just over 90 minutes at the movies. Inspired by, and based upon a true story, Diane plays widower, Emily Walters, who discovers a homeless man, Donald (Brendan) living in a shack on an abandoned hospital estate, opposite her apartment building. When the estate is earmarked for development she takes it upon herself to help save Donald's home. There's really not too much else to say. I went along to see this film because Diane Keaton was in it. She rarely disappoints and she gives a fine performance here. Brendan is fine as Donald, with just enough grumpiness to make his character something of a challenge for Keaton's Emily, but also enough charm to make him likeable. Surrounding them is a small supporting cast that we barely get to know and are really only there to interact with Emily and Donald as needed, as well as being a source for many humorous moments. Hampstead had the potential to be a much more thought provoking film as a commentary on the plight of homeless people, social causes, class structure, and living true to yourself. However it's also trying to be something of a light, romantic comedy, which stops it from delving too deeply into any one issue or even any of its characters. What it ends up being is just a pleasant experience at the movies. It's two leads deliver performances that are engaging enough to be very watchable, and the humor is evenly spaced so the film never really stalls at any point. Enjoyable if you just want to see an interesting story unfold without having to think too hard about plot twists and turns.